VATICAN CITY (CNS) — Along the difficult path of rebuilding their lives, survivors of the earthquake that devastated central Italy must also rebuild their hearts with a strong foundation built on hope, Pope Francis said. Families need something long lasting when coping with the heartbreaking wounds of losing their homes and loved ones, the pope told survivors during an audience in the Vatican’s Paul VI hall Jan. 5. “It is not optimism, there is no place for optimism. Yes, for hope but (not for) optimism, which is momentary; it isn’t sustainable. 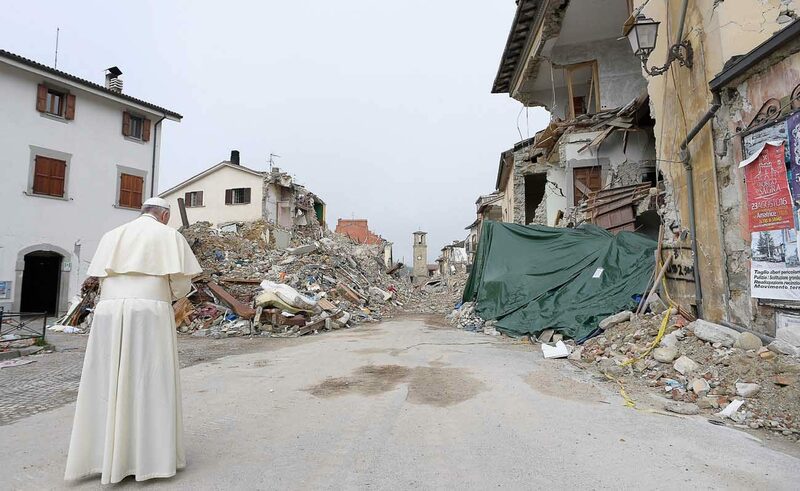 In order to rebuild, you need hope,” the pope said. The central Italian region, which includes the towns of Amatrice, Rieti, Accumoli, and Pescara del Tronto, were rocked by a 6.2 magnitude quake Aug. 24, 2016. Amatrice was the hardest-hit town, accounting for 234 of the estimated 290 deaths, according to the Italian Civil Protection office. “From the first moment, I felt that I needed to come to you! Simply to express my closeness to you, nothing more. And I pray; I pray for you!” the pope said during his visit Oct. 4. Several weeks after his visit, a powerful 6.5 magnitude earthquake struck Norcia in the early morning Oct. 30 and reduced the Basilica of St. Benedict to rubble. Arriving at the audience hall, the pope greeted thousands of victims and survivors of the earthquake, especially children who gave him handwritten notes and drawings. Others handed the pope photos of their loved ones to be blessed. Before addressing them, the pope heard from Raffaele Festa, a resident of Amatrice, who along with his wife, Iole, and two children — Leonardo and Lavinia — recounted their harrowing experience of survival following the earthquake. A priest from Spoleto, who was identified only as Father Luciano, also gave “witness to the strength, of solidarity, and help of my people” who came together following the tragic disaster. Jotting down notes as they spoke, the pope said he preferred to address survivors directly rather than through a prepared speech. “I want to take your words and make them my own because in your situation, the worst thing to do is (give) a sermon. Only by taking what your heart says and making it mine can I give a reflection on this,” he said. While those who have lost loved ones continue to feel the pain, the pope praised their bravery in choosing to not bring any more harm to “that which is already wounded” and to stay in their towns despite the devastation. “Each one of you has suffered something. Some have lost a lot — children, parents, spouse,” he said. “Silence, caresses, the tenderness of the heart helps” heal the pain of loss. “Thank you for all that you’ve done to help each other in rebuilding hearts, homes, the social fabric and — with your example” repairing the selfishness in the hearts of those who haven’t suffered this, the pope said.